Krish Engineers Is Manufacturer & Supplier Of Medium Frequency Water Cooled Capacitors In Ahmedabad, Gujarat. Medium Frequency Water Cooled Capacitors From 1 KV Up To Maximum 5000 Volts, To Maximum 7000 KVAr And Frequency Up To 50 Kilocycles For Indoor Use. with Dead Casing, Open Terminal (2 Bushings). with Live Casing, Open Terminal (1 Bushing). IEC 60110-1 Capacitors For Induction Heating & Melting Application. DIN EN 60110-1 Power Capacitor For Induction Heating Installations. Container: Imported Embossed Aluminium Sheet. Over Pressure Dis-connector Provided With NC Contact. Each And Every Medium Frequency Water Cooled Capacitors Are subjected To Routine Tests In Accordance To IEC 60110-1. Measurement Of Dielectric Loss Angle @ 50Hz. When Installing The Equipment, Relevant IEC Or VDE Recommendations Shall Be Observed. Medium Frequency Water Cooled Capacitors are Designed To Operate At Altitudes Not Exceeding 1500 Mtrs. The Medium Frequency Water Cooled Capacitors are Impregnated With A NON-PCB Based Fluid Which Is Jarylec C-1 01. This Dielectric Fluid Is Environmentally Acceptable, Eliminates Health And Environment Hazards. An Imported All Film Dielectric Is Used And Consists Of Polypropylene In The Form Of Bi-axially Oriented Film, Hazy On Both Sides, And In 2 Or 3 Layers With End And Edge Folded Aluminum Foil As Electrodes. Maximum Permissible Voltages Capacitors Are Designed For Operation At Voltage Levels According To The Following Table. significant Deterioration Of The Capacitor Depend Up On The Duration, The Total Number And The Capacitor Temperature. 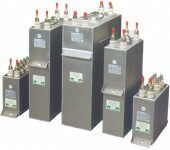 Each Capacitor Unit Shall Be Provided With Means Of Discharging To 75V Or Less. The Residual Voltage On A Capacitor Prior To Energization Shall Not Exceed 1 0% Of The Rated Voltage. Capacitor Units Will Be Suitable For Continuous Operation At An R. M. S Current Of 1.30 Times The Current That Occurs At Rated Sinusoidal Voltage And Rated Frequency, Excluding Transients. Imported Bi-axially Oriented Double Hazy Polypropylene Film And 99.9% Pure Aluminum Foil Are Used As Dielectric And Electrode. Wrinkle Free Winding Of The Elements Is Carried In An Class 100 Environment On A Semi Automatic Winding Machine With Edge And End Folding Of The Aluminum Foil. This Is To Eliminate Overvoltage Stress At The Edges Of The Buried Area Of The Foil. Each Wound Element Is Tested For Dry DC Overvoltage With Stand For Pin Holes And Adequacy Of Margins Between AI Foils. Numbers Of Elements Are Interconnected In Series - Parallel To Achieve The Desired Capacitance And Designed Voltage Rating Of The Capacitor. The Dry Pack Is Wrapped With Several Layers Of High Quality Insulating Paper Before Inserting It Into A Pre Treated / Degreased Aluminum Container And The Top Lid Is Welded By Semiautomatic Pulsed TIG Welding Machine. The Aluminum Sheet Used For Fabricating Containers Is Imported, Manufactured Of A Special Alloy With Its Surface Embossed. All Metal Parts Copper And Brass Are Silver Brazed To Ensure Homogeneous Joint. Porcelain Bushings Of Desired BIL Are Leak Proof Fitted On The Lid As Required. The Terminals Are Manufactured From Extruded Brass And The Water Cooling Pipe Is Of 99.99% Pure Electrolytic Grade Annealed Copper And Pressure Tested For Leaks Before Fitting On The Pack. On Specific Request Of Client, Imported Over Pressure Switches Are Also Fitted On The Capacitors. All The Joints Are Tightened With Torque Wrench And Are Locked To Ensure They Remain Perfectly Tight Always. The Capacitors Are Then Loaded In A PLC Controlled Autoclave For Uniform Heating @85°C And Drying Under Vacuum Of 0.001 Torr For A Given Period. After Confirming The Quality Of Drying By Precision Online Monitoring Instruments, The Capacitors Are Then Impregnated Under Vacuum With Highly Purified And Degassed Jarylec C- 1O1. The Capacitors Are Then Subjected To All Routine Tests In Accordance To IEC-60110-1. 1.10 8 H In Every 24 H System Voltage Regulation And Fluctuations. 1.15 min In Every24 H System Voltage Regulation And Fluctuations. Based On The State Of Art Plant& Machinery, Quality Of Raw Materials Used, Manufacturing Under Strict Quality Control And Process Using Precision On Line Instruments, And Elevated Over Voltage Test Results Under Extreme Temperatures, Capacitors Are Assured Of Minimum 20 Years Life. Each And Every Medium Frequency Water Cooled Capacitors Are subjected To Routine Tests In Accordance To IEC60110-1. Voltage Test Between Terminals 4 Vn For 10 Secs. Voltage Test Between Terminals& Container 2.15 Vn. Sealing Test @ 80°C For 2hrs. Magnewin Make Capacitors Are Manufactured To Comply IEC 60871 And BIS 13925 Standards Using Latest Technology, Materials And State Of Art Plant And Machinery. Experienced And Skilled Workmanship Enable's To Manufacture Highly Reliable And Long Life Performance Capacitors In Line With International Standards. Harmonic Filter Applications With Loads Viz. UPS, VFD, Furnaces And Converters, Etc. Other Ratings Can Be Supplied On Request. Air Cored, Aluminium Wound, Dry Type Reactors Are Used Along With Capacitors In De-tuned Harmonic Filter Applications. Rating: Detuned Reactors Are Available In 6% And 13 % Ratings. All The Capacitors Are Tested As Per IEC 60871 And IS 13925 Standards In Our Well-equipped In House Test Laboratory. Magnewin Capacitors Are Type Tested At Regular Intervals As Per IEC 60871 And IS 13925 Standards. Magnewin Capacitors Have Also Been Endurance Tested As Per IEC 60871-2 At NABL Accredited Independent National Laboratory. Each Element Is Protected With An Individual Encapsulated Fuse Complying With IEC 60871-4. The Sizing Of Fuse Is Calculated Using Specially Developed Software. Internal Fuses Are Designed And Placed To Isolate Only The Faulty Element Without Affecting The Adjacent Healthy Element, Allowing Uninterrupted Operation Of The Capacitor Unit And The Bank. Magnewin Has Developed The In-House Test Facility To Conduct The Internal Fuse Test In Accordance To IEC 60871- 4. External Fused Capacitors Can Also Be Supplied On Specific Request. Indoor Sheet Metal Cubicles Up To 33 KV For Switched Capacitors / Harmonic Filters / Automatic P F Control Panels And Structural Open Type Substation Banks Up To 145 KV Network Are In-house Fabricated And Assembled.